Here's The Naturalist in action, on a walk he is leading. 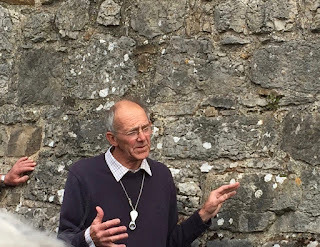 Having captivated a large (for this sort of activity) audience with the release of moths from his previous night's moth-trap harvest- so beautiful, so varied- he is here showing us an apparently insignificant black lichen thing, which looks dried up, and as dead as a dried-up lichen on a limestone wall could be. I've noticed them before and thought they were remains, an ex-plant, lifeless. He borrows someone's water-bottle, and pours a little of the contents over the black dusty thing. It almost at once turns green, and therefore, starts to photosynthesize again. In motor engineering terms, that seems to me to be like a car with a flat battery and an empty tank taking in a pint of fuel and hitting 0-60 in about 1.5 seconds. 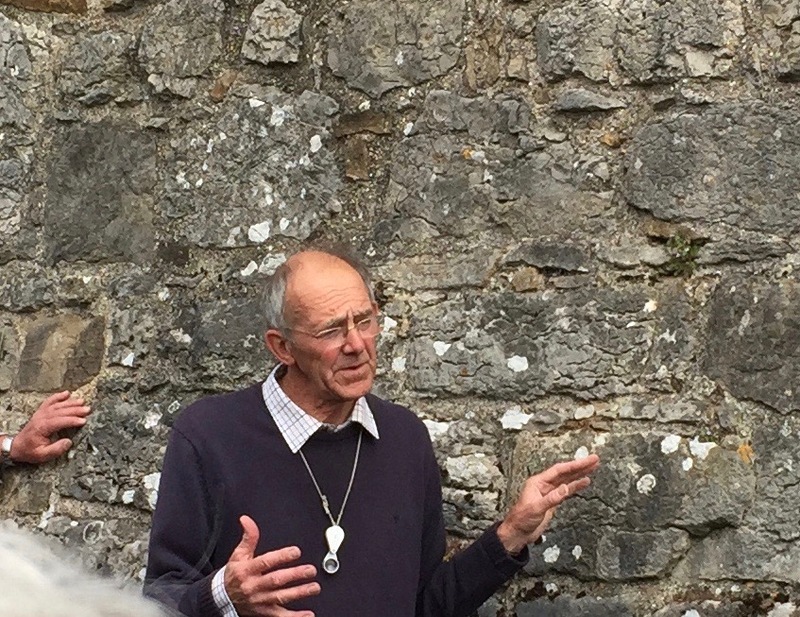 He takes us into a lovely little 12th century church, built of limestone blocks, and invites us to admire the flowers and plants in some recent stained glass windows, before he helps us get a truer sense of geological time. (i.e. time.) Geology as a time machine, a reversed telescope. We feel the church is ancient, in terms of our history. The blocks of which it is built are (I think he said) about 350 milion years old, and in that period (Caboniferous) there were three separate eras during which the tiny shells and skeletons making up the limestone were laid down in their billions, and compressed into rock. The three eras were several millions of years apart. We're a blink, in that sort of scale. "We've only been here a moment or two," he says. "Some might even say, too long." Again, all lightly done. And I remembered an ecologist I used to know who said simply that for all the other life forms we share the planet with, the invention of agricultues was a disaster. He wasn't anti-farming, he meant something more fundamental - hunter-gatherers don't build up surpluses, power hierarchies and huge populations. For that, you need agriculture. Standing by a rock pool close to the high-tide mark, The Naturalist contrasts a small brown seaweed (storm wrack? Oh dear, I've forgotten) with an equally insignificant green frondy sort of weed. A fungus has co-evolved with the storm wrack, and they depend on each other. If the seaweed starts to grow too far out into the sea so it is wet for more than 6 hours/day, (one high tide) the fungus dies - and so does the wrack. But if there's not enough sea, the fungus would thrive so much it would overcome and kill its host. Dynamic balances are working in both organisms and through evolution - this partnership took millions of years to get to that position. 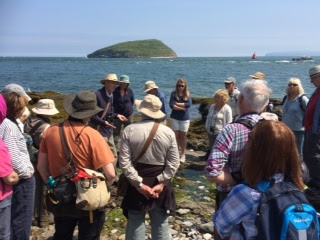 The Naturalist points down into the pool where the green weed sits, and says that it was from some such basis that green plants emerged from the sea and spread across the land. He holds up the insignificant brown weed and invites us to consider an alternative history of the planet in which it's the brown non-synthesizing organism that triumphs on the land. I guess everything, every single thing on the planet, would be different. No Bach, no Beatles, no - any of us. The thing about The Naturalist is that he isn't a twitcher; he's as delighted by the house sparrows in the eaves of the church as he is by much rarer creatures. It's life in as many of its diverse forms as possible that he celebrates, as he brings the aesthetic and the scientific vision together, like the two lenses of a binocular, and helps us to identify not just with species, but with life itself around us. The energy that we are part of is what he celebrates. His vision makes meanings for our lives, and that's why I think it is a Way.